Conscientious Extended | Who owns cooling towers? While thinking about and preparing this post, two other articles about this kind of subject matter appeared, both of which I’d like to point out first. There is Rob Haggart talking about four photographs with the same idea, and Christopher H Paquette writing about Influence & Originality in Photography. Influence obviously is a very important topic, since most photography is not produced in a vacuum. Originality I find a bit overrated, but you might disagree. That said, imagine the following situation: You start a photography project on some topic, let’s say cooling towers, and at some stage you discover that, son of a gun!, there are various bodies of work about that already. What do you do? Famously, of course, there are Bernd and Hilla Becher, with their typologies of cooling towers (top image). Do the Bechers own cooling towers now? I suppose, it might be safe to say that if you wanted to do a typology of cooling towers the answer would probably be “yes.” But there is quite a bit more you could do with cooling towers, right? Don’t believe it? Here are some examples. 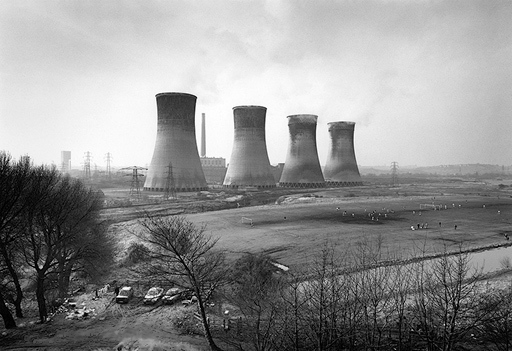 This is a photograph by Michael Kenna about Ratcliffe Power Station. Granted, it’s a portrait of a power station, but there is no shortage of cooling towers. I guess there is no need to convince anyone that Kenna’s project is very different from the Bechers’. This is an image from Jürgen Nefzger’s Fluffy Clouds, which focuses on nuclear power. Nuclear power stations come with cooling towers, and Nefzger’s landscapes have plenty of them. Again, very different from both Kenna and the Bechers. As it turns out you can even do a cooling-tower typology (of sorts) and get something that is very different from the Bechers. This image was produced by Jenny Odell, using satellite images. Just as an aside, there are lots of single photographs that also include cooling towers - there are too many all include them here (for example, this famous photograph by John Davies etc.). My point here is the following: Nobody owns cooling towers as a photographic subject. Taking photographs of cooling towers (whether directly or indirectly) is an idea that anyone can use. There is no copyright on ideas. What matters is the execution, whatever it is that you produce out of that idea. So when someone asks me whether s/he should give up some photographic project because someone else has been working on it typically is: No, just make sure to make it your own. For some ideas, that’s easier than for others. Plus, you have to be a bit flexible about influence. I have no illusions that debates about some photography being too similar to some other photography, about copyright violations and/or plagiarism will go away. They won’t because photography has become big business. But I thought I’d throw in cooling towers as an example of how a single idea can be executed very differently, in fact so differently that I might get emails with people telling me that one (or more) of the photographers above weren’t even working on cooling towers. I do think these four examples provide a good case why there is no copyright on ideas. Ideas are just that: Ideas. We can probably agree on whether something is a good idea, but in all likelihood once we start implementing them, the results will be rather different. So what I am looking for usually is not the idea, but its implementation. A mature, confident artist will produce something that is uniquely her/his own.